tool in the making of Japanese sake. It's called SAKABUKURO or SAKE SACK. No two sakabukuro are alike. Each changes color to the light. in where its stitches lie. We've nicknamed it the "SHIB". The cotton sack used for SHIB comes directly from the warehouse of the brewer , the reputable sake brand coming from the city of Nada in Hyogo Japan, also a famous area for producing refined sake. Brewers used the sack "Saka-bukuro" during the Edo- period to filter "Nigori-sake"(unrefined sake) into "Seishu"(refined sake). This process was used up until the early 20th century. Every summer, craftsmen repeatedly applied persimmon juice on sakabukuro to improve waterproofing and antiseptic properties. Due to this process, the cotton fabric's appearance has changed, similar to tinged brown leather. Patches seen in a few places are called "Mukade-nui" (centipede stitching), stitched by thick cotton threads with care.An alluring texture of strength and warm-heartedness, reminiscent of the long history of brewers' ceaseless precision and diligence. Persimmon juice is a natural waterproofing pigment. It is extracted after not-yet-ripe, astringent persimmons are crushed and squeezed into liquid, which is then kept in clay pots in a dark, cold area so the liquid can ferment and age for three months to one year. The cloth is exposed to sunlight for coloring after immersing it in the persimmon juice or brushing the juice over the cloth at room temperature. At the beginning, the cloth appears light beige. As it is dyed repeatedly,however, the cloth turns darker, from red brown to umber. During this period,the cloth also turns into a hard, leather-like texture. Because of its high waterproofing property, persimmon juice was always applied to fishing nets, as a base coat for japan ware, to coarse oil-paper umbrellas (bangasa in Japanese), rainwear, and stencil patterns. "SHIB" are made from hard-to-find,dark sakabukuro cloth that is elastic,like leather,and has a black shiny appearance. No two "SHIB" are the same color. Blurring and scratching reflect the unique texture of sakabukuro cloth to which persimmon juice was applied repeatedly over the years. Enjoy the esthetic texture of exquisite sakabukuro cloth once used for making exquisite sake. Every "SHIB" is sewn by hand with artisanal skills and dedication by the craftsmen that we finally able to find. Each vintage "Sakabukuro" cloth has a different appearance, delicate texture and condition, therefore it was not easy to find craftsmen who can confront with this difficult material. Finishing the work precisely and carefully with trained skills was not enough. We searched for craftsman whose work was bold and showed extreme originality. Craftsmen that could handle these various cloths -so old and rare, moreover, cloths in different sizes, colors, and designs. That was when we came across to these incredible leather craftsmen who are famous for making reins and bridles for horses. They had the excellent sensitivity of 'reading' leather textures, and they knew how to make the most of the uniqueness of materials. Their knowledge of leathers and their beautifully refined handling skills were enough to 'read' the quality of the leather-like "Sakabukuro" cloth. Their skills were perfectly aligned to "enjoy" the cloths character, and to bravely "determine" how to sew each individual stitch to complete the much-awaited "SHIB" tote bags. Gloriously hand-made by those leather-crafts artisans with willpower and instinct, each "SHIB" product has its very own heartbeat. Leathers used for handles and other parts of SHIB products are called "bridle leather", which is used for reins and bridles of horses. 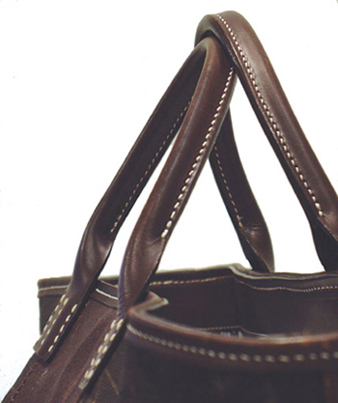 Tanning processes using persimmon juice keeps the natural texture and allows the leather to remain supple. 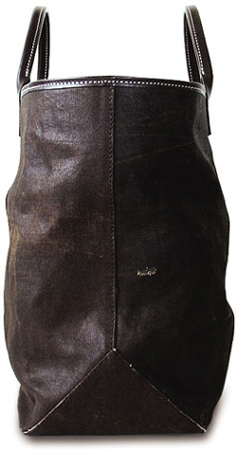 Paraffin can be seen as a subtle whiteness on the leather at the beginning of use. Within the process of tanning, paraffin oozes out to the surface as if the leather itself has begun breathing. The color will become richer and burnished after being used repeatedly. 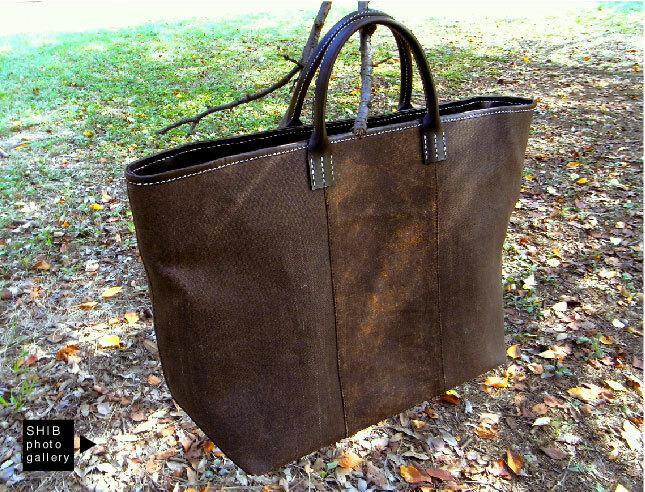 Tanned leather is said to be able to heal and comfort just by having it by your side or holding it in your hand. We wish you to embrace the great power of nature. We recommend you to groom with a brush or a soft cloth for prolonged use. Please note that the blurring, scratches, and patches are part of the charm of these antique fabrics. / Delicate cotton clothes or silks are used for the inside of some of the bags. Be aware when storing items that might damage those materials. / No two have the same exact appearance or texture. / Avoid using with white clothes since some slight fading may occur. / Wring a wet cloth firmly and wipe when it needs to be cleaned.